This page is not a forum, but if you will have an interesting comment, I will post it here for everyone to see. If there would be more positive than negative comments, we might open this page as a chat room. Lets be journalists for a while. There is a New Danger in Arizona Desert !!! Its not a Rattle snake, its not a Scorpion and its not any poison lizard! Well, but you can meet Rambo only if you accidentally get on my property. He is sleeping most of the day, but when he hears or smell something suspicious, he is alert. When I used to go with my dogs for a walk to the desert trails, I was always carrying a gun. and bullet is released. Faster than my 45 and way more dangerous and more deadly. Now I have to teach Rambo to release, or let go and come back to me. After all training will be done, Rambo will be eventually available for sale. 1. Why Presa and Dogo is not the same breed? Why Presa and Dogo is not the same breed? It's simple. If two dogs have a different standards they are two different dogs, period. On the beginning there was a Perro de Presa Canario. However, in 2001 There was a group of people who created new breed what they named Dogo Canario. 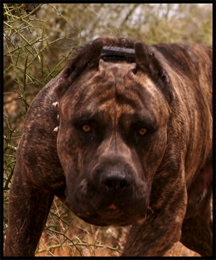 Dogo was created based on Presa Canario blood lines. Those Dogo breeders went different directions than Presa breeders, they breed Presa with Mastiffs, Dobermans and Great Danes, to achieve the look they like, so you can see these large Dogos with longer muzzle. Real Presa supposed to have shorter muzzle, large blocked head (like Hercules or Phantom) and according to old standards, male shouldn't be larger than 120 lbs. 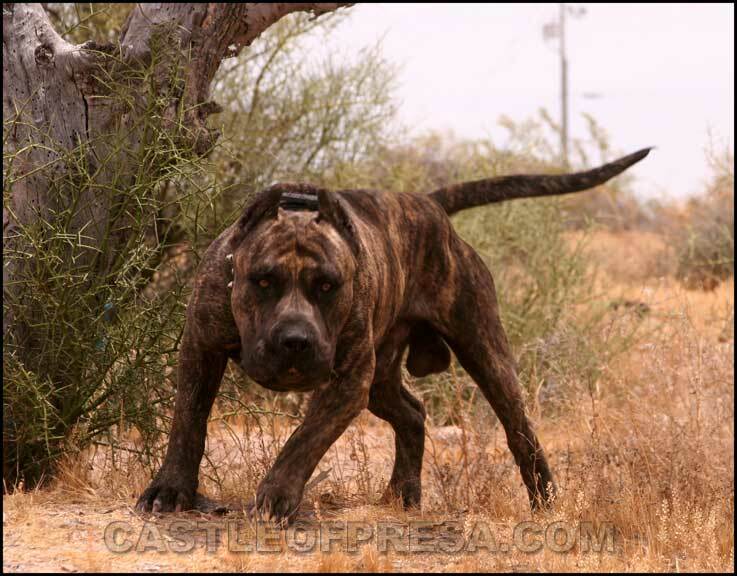 The oldest breeder of real Presa Canario is Irema Curto kennel based in Tenerife, Canary Islands. If you take a close look on Curto's Presa and on the other breeders Dogos, you will see the difference in appearance and also in temperament. Notice: On this page I would like to express my opinion on some important topics. Please don't get offended if you don't agree with me, it's just my personal opinion, based on my experience. However, you might also find some useful information what I learned and discovered during my 30 years of experience working with dogs.